Sleek modern styling and superior protection define the Solace LX, our signature case. Beauty abounds from hand polished aluminum crowns, genuine leather backing, and a soft-touch coated body. Toughness proliferates with CNC machined aluminum, the stainless steel SLS Screw Lock System, and 2-CUSH shock absorbing liner that meets rigorous military specification drop-test requirements. The ideal balance of beauty and toughness - it’s what sets the Solace LX apart. Designed in California. 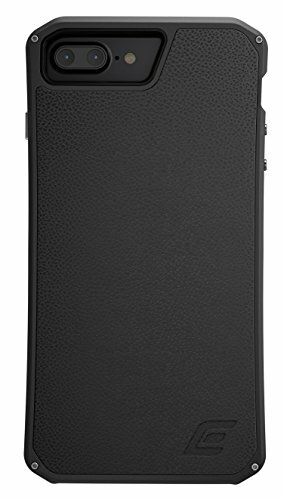 Genuine top grain leather wrapped back plate provides a luxurious feel with excellent wear properties. Hand polished, anodized crowns are CNC machined from aircraft grade aluminum and given a durable Tough-Luxe coating that is scratch and corrosion resistant. Easy-to-use stainless steel SLS-screw lock system secures the protective aluminum crowns to the main body - Speed Wrench included. E-TECH elastomeric liner material inside the case suspends and cushions the iPhone which allows the Solace LX to pass military specification drop-test protocol. Fast Tap CNC machined buttons protect iPhone controls while providing quick and easy use of volume and on/off functions. If you have any questions about this product by Element Case, contact us by completing and submitting the form below. If you are looking for a specif part number, please include it with your message.